Through experiential projects, students learned how to design and execute community-based research and social impact initiatives concerning education, housing, economic development, language, culture, identity, and social inequality. All first-year students in the program were matched with a local non-profit and learned about the organization through readings, hands-on research, and interviews with community stakeholders. 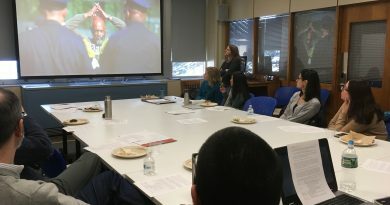 The students’ work culminated in the creation of short public service announcement videos promoting their organization’s involvement in the Hartford community. The presentations and dinner on November 16 in Trinity’s Hallden Hall marked the culmination of the inaugural semester of the Community Action Gateway Program, which joins several other Gateway Programs: the InterArts Program; the Interdisciplinary Science Program; the Cities Program; and the Humanities Gateway Program: European Cultures. Designed for highly motivated first-year students, the Gateway Programs are open by invitation to students who have specific interests and experience. Sam Houle ’21 appreciated the opportunities that the Community Action Gateway provided to become more engaged in the Hartford community. Houle chose to work with a local non-profit focusing on horticulture. “To have a school that encourages and facilitates these types of initiatives is great. For my project, we worked with Knox, which is a community program offering community gardens where people in the community can farm and grow their own foods,” Houle said. Each community partner had a three-student task force. Jones, Grant Hoeffner ’21, and Olivia Painchaud ’21 were involved with Achieve Hartford!, a nonprofit organization led by community and business leaders aimed at building a stronger city through improving the Hartford school system. Aidan Arnold ’21, Amanda Hausmann ’21, and Kevin James, Jr. ’21 worked with the Connecticut Center for a New Economy, a nonprofit designed to improve the social and economic well-being of Connecticut working families. The team working with the HartBeat Ensemble—which seeks to create provocative theater productions that transcend barriers of class, gender, race, and geography—included Eleanor Faraguna ’21, Charlene Taylor ’21, and Sam McCarthy ’21. The student team involved with Moral Monday CT included Tiana Starks ’21, Pranay Peddinti ’21, and Joe Celio ’21. Moral Monday CT is rooted in the social justice and civil rights movement and founded by Bishop John Selders, Jr., associate chaplain for Christian life at Trinity. Vasquez, Houle, and Divina Lama ’21 worked with Knox, an organization that uses horticulture and urban farming as a catalyst for community engagement. 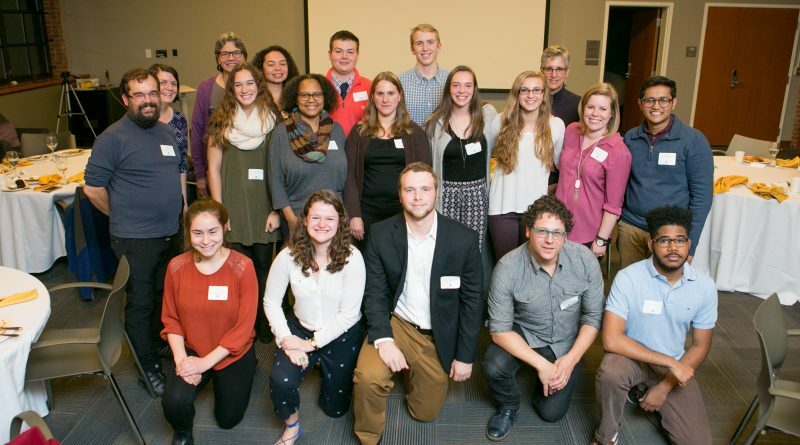 The Community Action Gateway program is part of Trinity’s Community Learning Initiative (CLI), which connects Trinity students across disciplines with the many communities that make up the Hartford area. Students, faculty, and community organizations come together in collaborative partnerships to carry out projects that both strengthen student learning and benefit the community. Each project is part of an academic course and is guided by the principles of reciprocity and mutual respect between the community and student partners. The Community Learning Initiative is supported, in part, by a grant received from the Davis Educational Foundation, which was established by Stanton and Elisabeth Davis after Mr. Davis’ retirement as chairman of Shaw’s Supermarkets, Inc.